Avoid the unnecessary high costs of installing temporary roads or purchasing large quantities of mats. 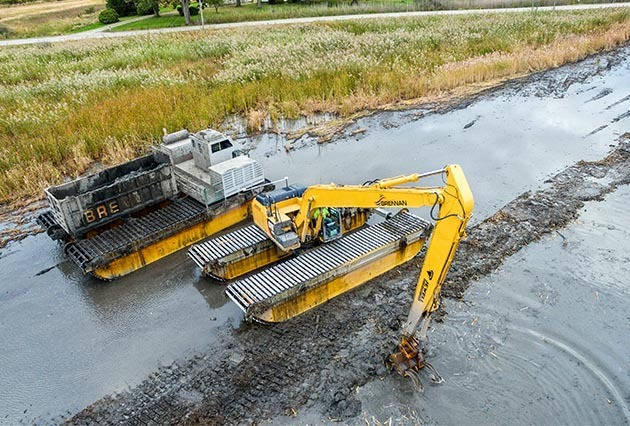 Brennan is the only contractor in the industry that can offer highly-customized amphibious equipment that can effectively remove contaminated sediment from wetlands and marshlands efficiently and safely. This method delivers value due to the elimination of significant site preparation required in traditional excavations. Our fleet of amphibious equipment includes large dump trucks, several excavators, an all-purpose use vehicle, and specialized survey transport. Marshlands and wetlands are characterized by soft ground that is sensitive to pressure from heavy equipment, while at the same time their dense vegetation prohibits access of any floating equipment. This condition adds a tremendous amount of risk to an environmental remediation project because heavy equipment can sink into the soft underlying sediment. Amphibious equipment greatly increases crew safety because it exhibits very low ground pressure due to wide tanks that will keep it on top of bog material, but also can float fully loaded with material when required. For a complete remediation it is possible to implement several kinds of excavation and dredging approaches. If barrier walls are required, Brennan's amphibious equipment is capable of accessing remote locations to install sheet piling. The dump boxes can be removed and our large amphibious dump trucks can be used as drilling and work platforms. J.F. Brennan Company specializes in water-based remediation and habitat restoration projects throughout the United States. We have successfully completed some of the most challenging environmental dredging and restoration projects to date. 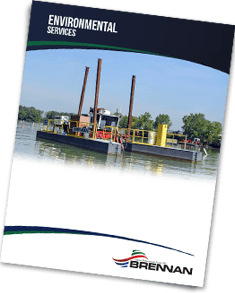 Download our brochure here to learn more about our amphibious dredging and wetland remediation capabilities and other services that we offer. 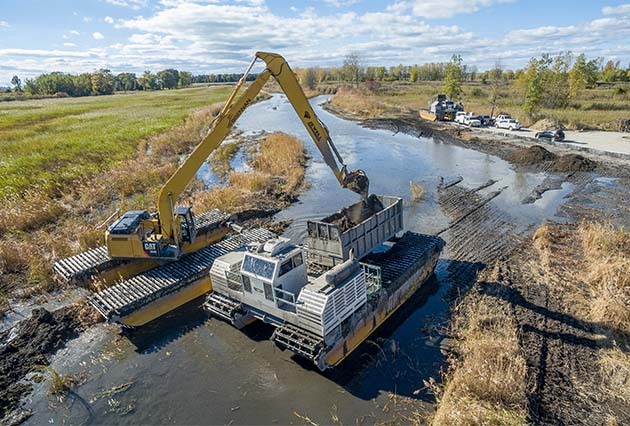 Want more information on Amphibious Dredging? Fill out the form below!